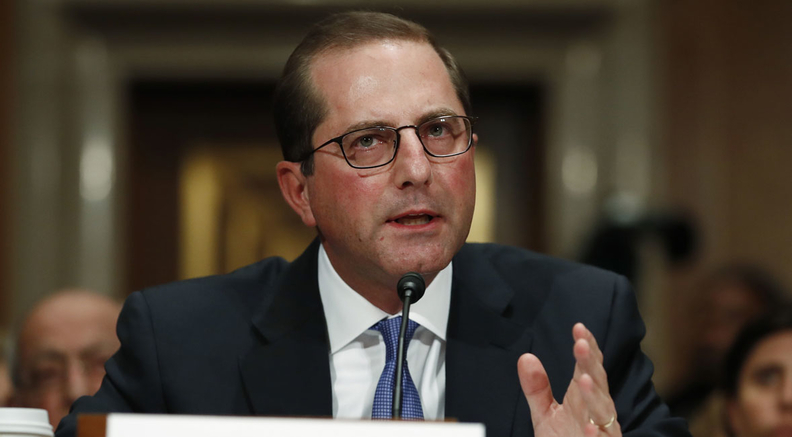 HHS Secretary Alex Azar predicted on Friday that commercial insurance plans are likely to eliminate drug rebates after a rule goes into effect that nixes a safe harbor for Medicare Part D and Medicaid managed-care plans' rebates. HHS released a long-awaited proposed rule Thursday that would get rid of the safe harbor protections from anti-kickback laws for Medicare Part D drug rebates that drugmakers pay to pharmacy benefit managers and insurers. Instead of the safe harbor protection for rebates, the proposed rule would create a new safe harbor protection for discounts to drugs delivered at the point of sale and for certain PBM fees. The proposal, which if finalized would likely go into effect in 2020, doesn't apply to commercial plans. However, Azar said that commercial plans will likely follow suit and get rid of the rebates, which he charges create a perverse incentive for drugmakers to raise list prices. Azar said that plans will likely want to create the same system for a private plan that they do for Medicare. "The same players are doing commercial and doing Medicare. That is a very difficult task to segregate," Azar said during a conference with reporters on Friday following a speech at the Bipartisan Policy Center in Washington. He added that states could also adopt the new safe harbor protections and states could outlaw rebates for private plans. Azar said that about 30 states have imported federal anti-kickback statutes. If states adopt the new safe harbor protection then it could create another incentive for private plans to follow it, he said. But PBM and insurance industry has vociferously pushed back against the proposal, causing skepticism on whether they will follow through and get rid of rebates for their commercial business. "We believe the administration should go back to the drawing board and start over with this proposed rule, and instead take actions that will lower drug prices and hold drugmakers accountable for the prices they set," the top insurance lobbying group America's Health Insurance Plans said in a statement. HHS has targeted rebates that drugmakers pays to pharmacy benefit managers or insurers since the release of the administration's drug pricing blueprint in May 2018. The administration alleges that the rebate system keeps drug prices high because the PBM and insurer gets a cut of any rebate, so they will only cover on their formulary or plan a drug with a higher cost in order to get a bigger slice of the rebate. Another concern is if a drugmaker agrees to pay a higher rebate to a PBM in order to keep a cheaper competitor off the PBM's formulary. If the proposed rule is finalized, then it means such rebates would not have safe harbor protection from the anti-kickback federal statute and companies could be subjected to prosecution by the Justice Department for getting drug rebates for Medicare Part D plans. The proposed rule would create new safe harbor for discounts that are offered directly to the patient and for management and other fees that a drugmaker pays to a PBM. The proposal will be published in the Federal Register some time next week and then there will be a 60-day public comment period. Azar said on Friday that after the rule is finalized it will be implemented within 60 days of the date of publication of the final rule. The administration plans to cease safe harbor protection for rebates starting Jan. 1, 2020. Azar said that plans and PBMs can start to change their pricing structure now. "Nothing stands in the way of pharmacy benefit managers skating where the puck will be even sooner by changing their contracts," he said. But the rule only applies to Medicare Part D and Medicaid managed-care plans. Implementing the proposed rule into the commercial space would congressional action. Azar said he is in talks with lawmakers on a variety of drug pricing issues but didn't say if a specific bill is in the works. "There is a lot of energy on the hill to look at various provisions," he said. Some Republicans have been in favor of changing the rebate system, such as Sen. John Cornyn (R-Texas). "Obviously it is not a transparent arrangement and it does produce upward pressure on drug prices and obviously the negotiation between the PBM and the pharma in terms of what the net cost is is not transparent," Cornyn said during a hearing of the Senate Finance Committee earlier this week. So far some top Democrats have been cool to the proposal released late Thursday. "The majority of Medicare beneficiaries will see their premiums and total out-of-pocket costs increase if this proposal is finalized," Reps. Frank Pallone (D-N.J.) and Richard Neal (D-Mass.) said in a statement Thursday. Neal is chairman of the House Ways & Means Committee and Pallone is chairman of House Energy & Commerce Committee. Azar said the administration estimates Medicare Part D premiums will increase by three to five dollars a month, on top of an average premium of $40. However, the premium hike will be offset by lower prices at the pharmacy, he asserted. "This brings in savings to them every time they walk into the pharmacy," Azar said during his speech.